The music room is next to Wilhelms Eck (first floor Damenhaus). 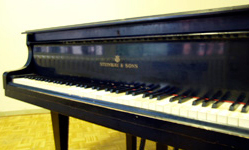 We provide there a Steinway grand piano, a guitar and a percussion instrument. If you want a key contact the music tutor. If you need any kind of tool, contact technical tutor of the hall council.